William Henry Cox, better known as Bill, has not always lived in Jacksonville. To the surprise of many, he has not always worked at Boyd Music. Cox was raised down the road in Winchester and made the official move to Jacksonville 23 years ago. At least one person reading this has had Cox as a guitar teacher. 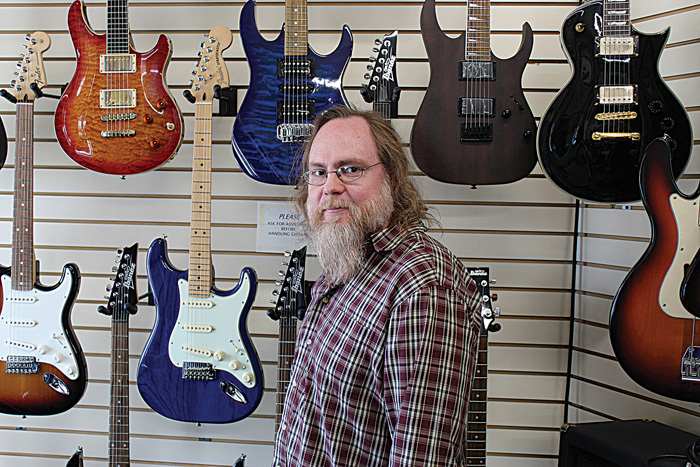 Cox has been teaching guitar since he began playing in 1984 and has helped a countless amount of people learn to play along the way. For Cox however, music is more than a pastime, it is a passion. The guitar is his medium of worship. Religion, like music for Cox, plays a big part in his life and they walk hand in hand. Cox has been the worship leader at Jacksonville Assembly of God Church for the past 10 years. The books he would take to a deserted island to keep him company include: The Bible, “Mere Christianity” and “Foundations of Christian Doctrine.” Growing up as the youngest of two brothers and two sisters helped Cox develop a love of family. Today his family is even bigger, he has five kids with his wife (Sherry). Though leading worship and teaching guitar take up a large chunk of time for Cox, when he does have time away from work, he makes it a priority to spend it with his wife and kids. When asked about living life without any monetary concerns, Cox provided great answers. First, he would buy his own National Football League (NFL) team and then he would help the comic book world by producing an award-winning Superman movie. Cox would also try to travel more if but wishes he could have the ability to fly because it would cut travel time down substantially. If you are looking to learn how to play the guitar or just want to say hi, you can find Cox throughout the week at Boyd’s Music or on Sundays at Jacksonville Assembly of God Church.